Before we start talking about attachment types in detail, let’s cover some background in neuroscience and communication, and how people regulate their degree of intimacy with others. Human brains have three main parts: first to evolve was the core reptilian brain, which handles basic functioning of the body and primitive reflexes; all animals have this. Next came the limbic system, found only in mammals, which handles emotional and basic social functioning. Layered on top of that is the neocortex (“new brain”), which was last to evolve in mammals but is massively more developed in the human family tree; this huge new brain annex handles the verbal and intellectual processing that sets us apart from other mammals. Our consciousness and verbalism are recent additions to our species. It is easy to forget that all of our thoughts and the streams of words and symbols that run through our heads when we are “thinking” are easily overruled by the more primitive sublayers, which were designed to keep us alive and force nonverbal, unthought actions in the case of threat. Our limbic system, in particular, keeps track of the world around us and reacts to what is sensed to produce emotions to attract, repel, attack, or embrace. Attachment is a limbic phenomenon; love is deeper than words, and sometimes beyond our ability to verbalize. The dance of signals between mother and child in the child’s first years develops the child’s emotional system and its emotional response to other human beings, and while children can learn from all of the caregivers in their lives, the first is the most important. Children who are not touched and responded to in early life often sicken and die. And children who are given the wrong kinds of signals will spend a lifetime being lonely or having trouble with their partners as a result. Our culture is full of models and stories about love and relationships. First there’s the “fairy tale” of two lovers finding their uniquely perfect partner, falling madly and mutually “in love” (before they can possibly really know each other), and living happily ever after in a cottage with a white picket fence. While this does happen, it’s not common, and real tales of love and long-term partnership are rarely so simple and sweet. Then there’s the recent hubbub over “codependence”—an idea which began in addiction studies, where an alcoholic, drug addict, or other self-destructive person is enabled by a partner who works to prevent the addict from either getting better or reaching the point of despair sufficient to convince the addict to start anew. Is dependence on another a bad thing, or unhealthy as sometimes implied? No, of course not—we are all dependent as children, and depend on each other more or less our entire lives to accomplish things and feel happy. In a theme we’ll return to over and over, being dependent on a reliable person when you need it is good. Being unable to function without the support of others when you need to is bad. As we note later, the most secure children were raised by mothers who seem to sense it almost before their child needs help and assist immediately and just enough, while not hovering or invading the child’s independence when they are exploring the world just fine alone. We see that the same “just when needed, just the right amount” principle of dependence acts between the best partners, and best friends. The best partner is responsive to your signals, and you as a good partner signal only when you really need help. Most of the trouble in relationships is about bad signaling and poor responses. 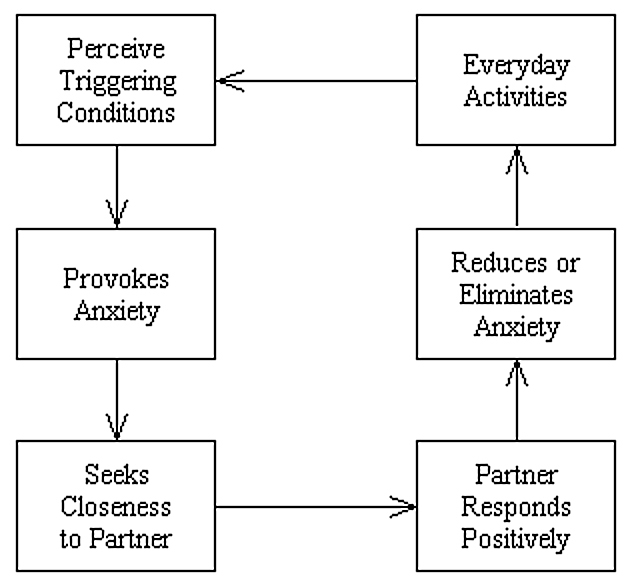 One partner’s anxiety is triggered by external problems or simply a lack of recent reassurance. He or she signals (by moving closer, or asking for reassurance, or sending a message) the other partner, who responds with a message of reassurance (by snuggling closer, or saying something supportive, or sending a positive message back). Reassured, life goes on for both of them and anxiety-producing threats are dealt with. Here the partner asking for help or assurance gets either no response or a negative response—the other partner either fails to message back or sends a message refusing support. For example, the partner seeking assurance moves closer and tries for a hug, but the declining partner gets up and leaves. Or a direct statement asking for help (“I need you to go with me to the nursery so we can pick out some new plants”) is met by rejection (“I don’t have time to go with you since I have to pick up your brat after his soccer practice.”) The response in this case increases anxiety and leads to more insistent messages asking for support; the requester is anxious and the decliner has even more reason to see themselves as put-upon by the requester’s demands. 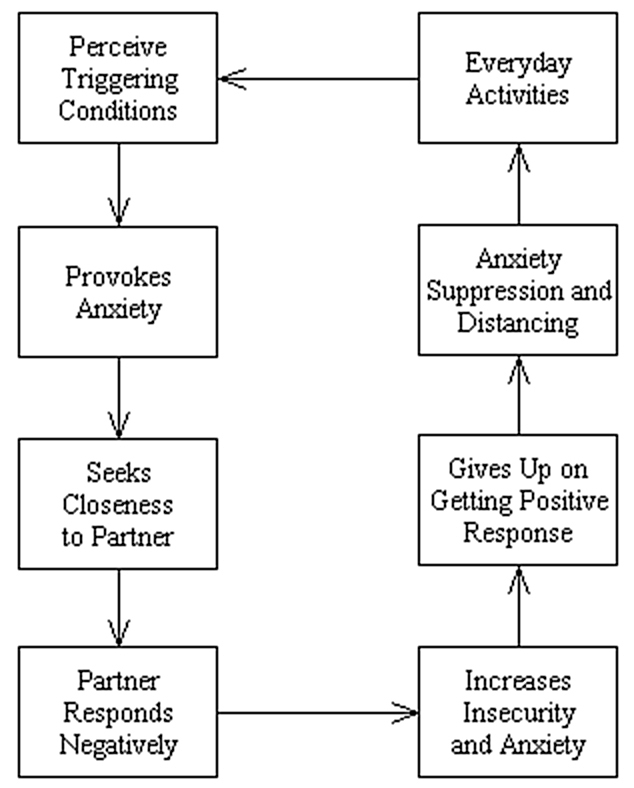 If this cycle repeats too often, the attachment will weaken and the next strategy, attachment-avoidance, will be used. Here the partner requesting assurance handles rejection by distancing—lowering their expectations of support from the other partner. This pattern shows the breakdown of the request-assurance system and if predominant ultimately results in a broken or unhappy relationship. 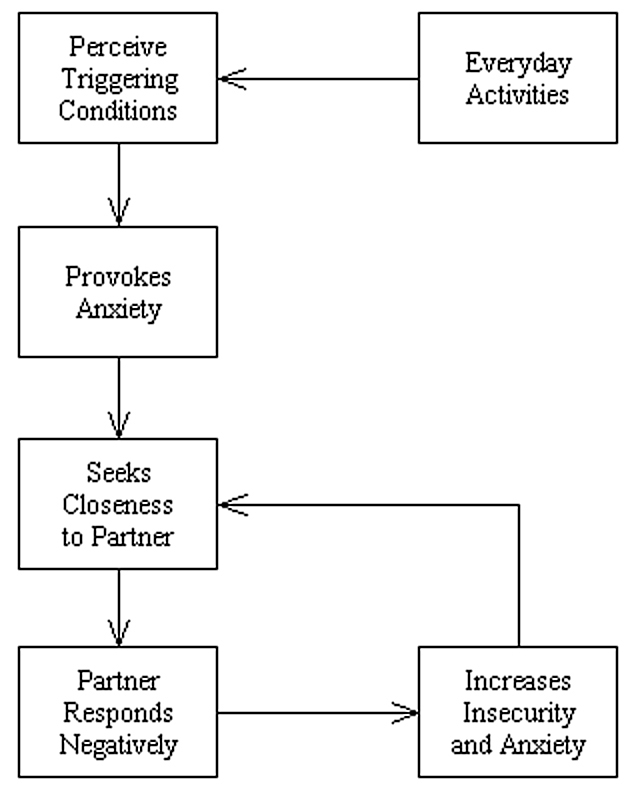 Note that nothing is inherently good or bad about any of these patterns, and all relationships have moments in the less secure loops – but a couple which spends most of its time cycling through the hyperactivation or attachment-avoidance message cycles is not likely to feel happy and secure in their relationship. How true this all is. My wife is Dismissive Avoidant, I am Anxious Pre-occupied and identify with this behaviour entirely. I only found out about this after seeing a Therapist who described my wife’s type. After over 30 years of marriage I finally have an answer to this mystery in my relationship. I now find it incredibly difficult to know what to do next as I love my wife but see no real happy future unless she owns this which she won’t.